Barrett Meeks wandering around Brooklyn like Leopold Bloom, but instead of a kidney in his pocket, he’s got a memory on his mind, a vision of a light in the evening sky. A celestial light revealed only to him, a beacon of some hazy hope he never quite grasps. This is why I was so frustrated with Michael Cunningham’s The Snow Queen. I haven’t been able to pen my frustrations for myriad reasons for the characters in the book seem so pathetic and the story so unsatisfying. Creative, witty, thoughtful, urbane, and each ingloriously cresting their youth. Ah, the middle age narrative. The stifled yawn at life and the tepid look around, is there nothing more than this? It’s so depressing, but so real. Who wants to trudge through that cold snow?! I think I would have liked this book better if the promised transcendence were resolved or at least hinted at, but the story wanders toward an unsatisfactory conclusion. Any hope the characters reach for is compromised. Like the shabby Bushwick apartment they live in, they only manage cheap attempts to feel more at home in the world. Barrett can only bring himself to creep into the back of a dimly lit church. His brother Tyler wants to go out into the storm; he wants a certain clarity that comes from feeling naked in the snow, but he can only bring himself to the window ledge. It’s all a flirtation with jumping. No one leaps. And I just love people who leap is all. Cunningham’s story is about searching for authentic, transcendent experiences, but his characters are self-absorbed, indecisive, and utterly hopeless — and they wonder why they aren’t successful. They struggle to retain any optimism they have left and hope for them becomes “a cheap jester’s cap.” Who has time to wear it anymore? Cunningham is fond of these despairing characters clutching breathlessly after beauty and truth, but at least Peter from Cunningham’s previous novel By Nightfall actually dares go after them. Yeah, it’s all an illusory quest and sure, his hope is dashed in that novel, too, but that narrative ends with a sense that he’s learned something profound in the process. It’s hard to read a story like this, characters like these, because while I most certainly identify with their cosmic pain and carry similar questions in all my pockets, yawning and looking around just the same as they do, I can’t imagine living one day without hope. Even when I find myself in deep holes, I’m always looking up for the light and clawing my way back into its grace and comfort. Perhaps my ready rope is gratitude and faith and an awareness of our interconnectedness, of an eternal loving divine presence . . . the colors, dear Byron, that never rub off. If you liked this post, you might also like these: On Gravity and What Grounds You | Happiness, It’s Only a Day Away | Thinking About Michael Cunningham’s New Book? Feeling under the weather this week, well, more like under a truck, so I thought I would invite littlest love to be my guest blogger. These pieces come from a portfolio she put together for her fourth grade teacher and shared this past weekend at Open House. I must say in re-reading them now they have become this mother’s song for the week — light and love and hope that fill me with gratitude. Those donuts? Working. I believe the happiest day of your life is when you do something incredible for someone and you feel REAL joy. The wisest people in the world are those that feel real joy every day and know the true meaning of life. The biggest mistake is being greedy and wasting your life and the abilities you posess (sic). Real love is sacrifice and a loving melting feeling in your heart. Life’s greatest gift is knowledge, joy, faith, and of course LOVE. Religion means how a person can adapt to the love of God and love back with all their heart. Have you ever seen the light of the cross in someone? A person I would consider my disciple of Christ is my Nana. She is petite, plump, has rosy cheeks and short gray hair. There are many reasons why I consider Nana my disciple of Christ. She’s generous and kind because she always brings us a gift every time she comes to visit. She brightens my heart with her positive, silly, and forgiving attitude. She never fails to make me smile with her funny, loving, and patient ways. A special time I remember spending with my Nana was when she took me and my sister to see the Christmas lights in Los Gatos. It was so fun! There were volcano lights that spewed lava and arches of lights that shone and looked like a thousand fireworks. We drank hot chocolate and had a great time. One special quality I hope to make part of myself is to be as caring as my Nana is. Autumn is a world of colorful changing leaves and trees preparing for the barren winter. Squirrels scamper across the ground, searching for acorns. The air smells of wet leaves and fallen pinecones. Winter reminds me of a lonely snow covered forest dotted here and there with snow-less green patches that are conifers that have shaken the snow off of their elegant green boughs. A glitter of beauty on the branches of trees are icicles that glitter and sparkle like diamonds when the bright winter sun catches them. Spring makes me think of life. Buds appear on trees and burst into bloom. A quiet drizzling rain soaks the ground and trees. The robin sings of new life and prosperity and all the birds sing back, making a beautiful choir. If you had to make a list today of all the men and women who have crossed your path and touched your life in some way, wouldn’t that list be long?! Who has encouraged you? Inspired you? Helped you through difficult times? Danced with you and laughed with you? I imagine some of these people have come and gone, but what they’ve left behind! You, of course. 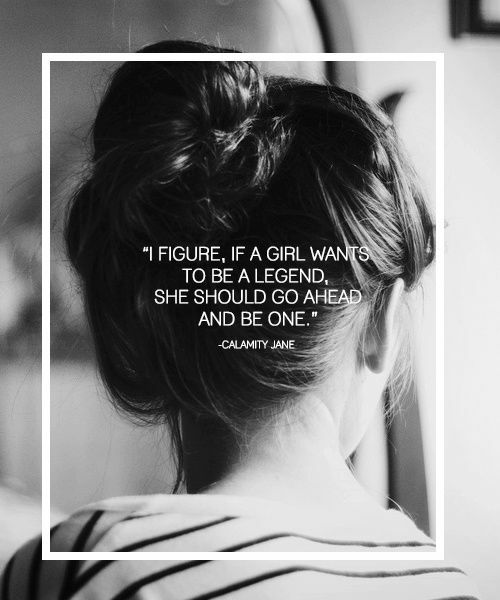 This quote from Calamity Jane sums me up in many ways; it’s one of those core ethics I try to instill in my daughters. It calls to my mind this snapshot I have of me with my mother and siblings, taken when I must’ve been in third or fourth grade in the 1970s, and in the photo I stand all sass with one hand on my hip in a pair of shorts and a pale yellow capped sleeve t-shirt, with those groovy seventies bubble letters like bright red puffy clouds painting across the sky, Girls Lib! I can’t imagine one of my daughters wearing such a t-shirt today, but then again, I just bought my biggest love a white t-shirt with black typeset letters that says, I might change your life. Why am I surprised she loves it? If I were to rest a moment right now and reflect on all those who have in some way nurtured this value in me–that I matter and can make a difference and have a voice–all those who are continuing to pour out their encouragement through me as I raise these girls with the same inspiring hope, that list would be long.